Apparently broccoli and cauliflower are not very popular. I am basing this statement on the fact that every time someone brings a veggie and dip platter to work I get to eat all of the broccoli and cauliflower. They go crazy for the carrots but won’t touch my two favorites. Biff, stop aiming cannons at your face! I like broccoli! But I prefer it steamed to raw, generally. Sometimes with cheese! you are not alone! broccoli and cauliflower are pretty much my favorites. Only thing better is both at once, and I hear they have that now. Broccoli and cauliflower raw does not appeal to my taste buds haha. Broccoli and brussel sprouts have a chemical that makes them bitter to people who have a specific gene. I gotta say it – I really don’t like either of them. Okay, I take that back – I can eat broccoli raw, and my mother does make an amazing cauliflower soup… But that’s it. Cooked broccoli = THE most disgusting thing on this planet (bar asparagus, even the smell of that stuff makes me gag). And since I grew up on a farm, this fact has caused me no end of grief. Luckily there was other good vegetables (and fruits), I just really don’t like broccoli. I… Still don’t get why people don’t like those two. They’re amongst my most favourite veggies. I feel like the odd man out here, but I’m not too fond of cauliflower. I just can’t taste it worth a damn by itself; with ranch or cheese, I’ll eat it no prob, but by itself, it’s just too bland for me to really enjoy. At first, I somehow read that as CATS were eating a lot more vegetables. I love broccoli and cauliflower….with cheese OR with ranch. I like carrots ok but I LURVS baby carrots. @Drakey They really should make a plant called the Brocliflower. That’s what I call power! I wish my cannon wouldn’t even make it across the room. Stupid heavy Broccoli. 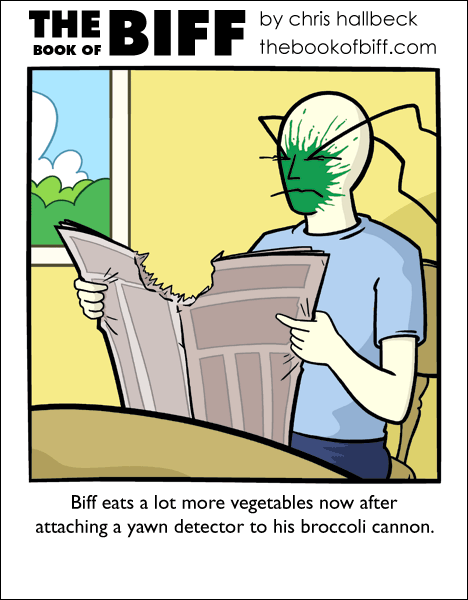 another cannon in the face lol, this time veggies. Asparagus, however, cook that up in butter and garlic just long enough that it’s still crunchy and NOMNOMNOM. Any cooked and mushy vegetables turn my stomach. Broccoli has one purpose in a vegetable platter, and that’s to be the vegetable with the most convenient shape for maximizing ranch dressing saturation. Easy to hold on to stalk, and a dipping area with a vastly superior surface area when compared to celery or, god forbid, carrots. But Cauliflower? What are you? Nuts? I’m not crazy about broccoli, but I eat some regularly on the basis that it’s probably good for me. Cauliflower, OTOH, is just nasty. Raw, cooked, with cheese, doesn’t matter, I can’t stand it. Oddly enough, I used to like it pickled, although I haven’t had any in years. Never have been a fan of cauliflower. One, because I dislike the taste, but two, because it’s so hard to spell. I want to spell it cauliflour every time. Broccoli, on the other hand, is amazing when steamed. I’m not the world’s biggest fan of cauliflower with anything on it, though plain it’s kind of boring. Broccoli stems are okay raw in a salad, but otherwise it’s best cooked very quickly so it’s still all crunchy. I can tolerate broccoli as long as it’s in something (Chinese food, Japanese food, soup, etc. ), but I simply *cannot* stomach cauliflower. @Matt Lee: BTW, there is a cross between broccoli and cauliflower called broccoflower, looks like a green cauliflower. Never have tried it tho. mmm. I love cauliflower and broccoli even more, but you have to be very careful when eating it sometimes. If it’s in a soup or sauce, like Shanghai Noodles, the steaming hot liquid gets trapped inside the tufts, and it all squirts out when you bite. Ouch. @Skydiver Todd I did not know that. Thanks for the info. I loves broccoli and cauliflower both. NOTHING is as good as cutting a stalk of broccoli directly off the plant and eating it right there. Mmm…. nom nom nom. I prefer both raw, but with enough cheese, broccoli becomes awesome cooked. I used to have a broccoli cannon but replaced it with a broccoflower chain gun. If you haven’t tried broccoflower yet, it’s a broccoli-cauliflower hybrid. I also suggest eating it from a chain gun, but any vegi-launcher will work. I understand broccoli, cabbage, Brussels sprouts and cauliflower are all different strains of the same plant, so almost any combination is possible. Anyone for a vegi rocket-launcher? I love broccoli and cauliflower, but I HATE Broco-flower. What’s up with that? Genetic mutation, that’s what. Man I love broccoli and cauliflower.